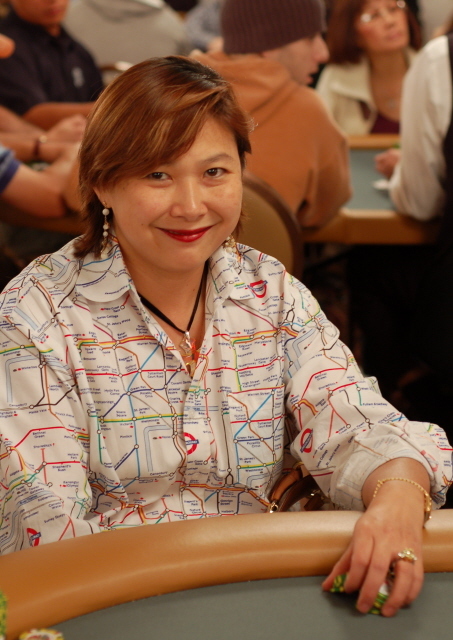 JJ Liu took top honors at this year's WPT Ladies Night IV. In the talented field, JJ was the obvious veteran, with 45 major tournament money finishes in her ten year career. Kelli Griggs was the designated "newbie" and the only amateur at the table. When the event reached heads-up, it was Liu vs. Griggs vying for the $25,000 seat into the WPT Championship event and the WPT Championship ring. It was an aggressive and fast affair, reaching its conclusion in just under three and a half hours. Griggs set the tone early that as the acknowledged amateur, she wasn't going to be pushed around. She won her first pot of the night with a monster bluff which she proudly displayed. Griggs went on to bust defending champ Jennifer Tilly and Vanessa Rousso in quick succession. While I'm sure Tilly wasn't happy about being the first one to depart, she already had locked up seat by winning the Paul Hannum Charity Tournament earlier this week. JJ Liu turned up the heat and took out Erica Schoenberg and Anahit Galajian to take the chip lead. The final heads-up hand was a battle of kickers when JJ and Kelli both paired sevens on the flop. JJ's king kicker held on against Kelli's queen. On some level, I envy JJ and all the great opportunities that this will open up for her. But I know in her case, recognition is well deserved and was hard fought and won over her ten year career. It's really her hat collection I most envy. She has the best hats in all of poker!! Congratulations JJ LUI!Your hardwork and good strategy had payed off.Keep the high spirits going! These all final and work of the good strategy and also one of the payed off in all the way it can be great and going out of the spirits these all are great to know about it.